After a couple of trips to investigate, things became clearer. 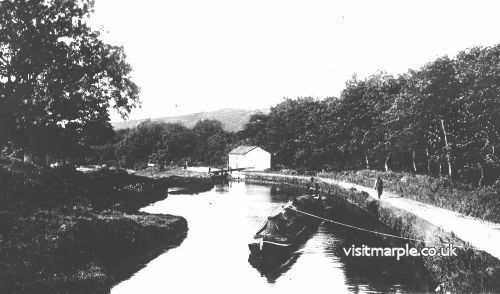 The scene is Lock 3, viewed from Lock 4, and there used to be a building next to the lock that is not described in any of the present local history or canal publications. It doesn't look big enough to be a cottage and was possibly some kind of industrial building - a small warehouse or storage building perhaps. 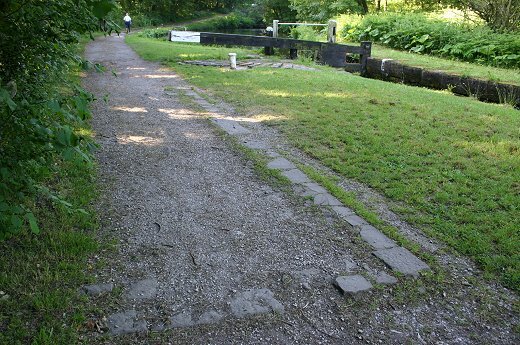 If further evidence is needed before you're convinced, take a look at the footings that can still be seen directly alongside the lock. Footings at Lock 3 - Mark Whittaker.